Statistics show that burglaries can be up to 20% higher during the autumn and winter months, as thieves take advantage of the darker evenings, so now is the time to be thinking about home security. Technology is continually changing and evolving in all aspects of life, including security. For maximum protection and peace of mind there are new products on the market that ensure your home is safe and secure at all times. Digital door locks are the very latest in lock technology. They are modern, stylish and can be quickly and easily fitted to the majority of front doors, whether they be timber, PVCu or composite. Digital locks are particularly useful for families laden down with heavy shopping bags struggling to fish keys out of handbags or pockets, or those who are constantly misplacing their keys. They also make these hassles a thing of the past as they allow you to access and secure your home using a PIN code of your choice, without the need for keys. 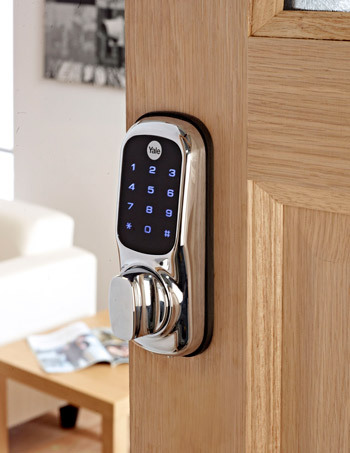 Home security specialist Yale offers digital door locks that boast clever security features, including include the fake PIN code function, which prevents others from identifying your passcode during access. This works to confuse onlookers, while at the same time allowing you to enter your PIN away from prying eyes, keeping your home safe and secure. Another advantage to digital doors locks is that they are ‘pick proof’. The methods criminals use to break and enter are continually improving, but, with digital door locks there is no need for a key so thieves are unable to ‘pick’ the locks, hence increasing security. Distraction burglary is affecting thousands of households per year in the UK, so seeing who is at your door before you open it has never been more important. According to the Home Office, around 11,500 homes a year fall victim to ‘bogus callers’ entering their homes under false pretences. Digital door viewers solve the problem of having to look through a traditional spy hole to see who is at your door by offering a clear digital image that can be seen from several metres away. Yale’s digital door viewers have large, clear screens and can be viewed from all angles, allowing vulnerable or elderly users, to easily see who is at the door. The Yale Recording Digital Door Viewer also has a built in camera, enabling you to take pictures of anyone who is approaching your door. Another area of security that has been modernised by the digital era is the home safe. 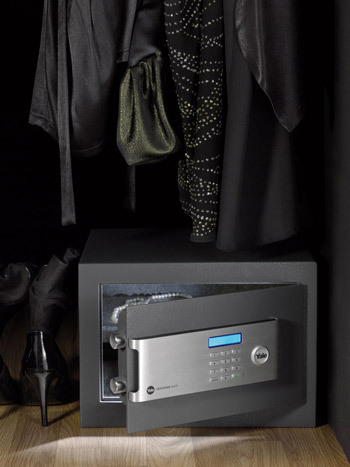 Digital safes provide an excellent way to secure cash, jewellery and other valuables from potential burglars. Yale Certified Safes are designed to be the strongest, most reliable and the hardest to crack. They have thick walls and doors, with additional armour plating to protect them from potential drill attacks. The doors are also laser cut, making it difficult for thieves to force the safe open. On top of this, the safes can be cash rated depending on the value of your items. With all these latest gadgets available, it is now even easier to keep you and your family secure this winter.